Is it possible to convert OGG files to MP3? Now when we talk about video conversions, it's no longer a problem at all since we have plenty of online and offline conversion choices. In this article, we offer you the most stable and efficient desktop OGG to MP3 Converter, and also 10 top online tools to offer you a light on how to convert OGG to MP3. iSkysoft Video Converter Ultimate lets you convert any video and audio between all popular formats. Using the latest Mac encoding and decoding technologies, this Mac Converter provides superb fast conversion speed and batch conversion support, this means, even when you convert a bunch of OGG songs to MP3 at the same time, you won’t need to wait long at all. Actually, this Mac program is a time-saving one not only due to its excellent conversion speed and batch conversions support, but also because with its intuitive user interface, you can easily finish your OGG to MP3 Mac conversion within 3 steps. High Versatility – this is a tool that will convert more than 150 video and audio formats. It will convert both HD and standard video and audio formats with ease. High Speed - iSkysoft Video Converter Ultimate converts as more than 90X the speed of other converters. This is faster than has ever been recorded. High Quality - iSkysoft Video Converter Ultimate will convert video without affecting the quality at all. This is why it is loved by professionals in the video industry. Great editing – you can now edit all your videos using the inbuilt video editor. This is one of the converters that give you this feature. Burn to DVD – you can now send your videos to your DVD to add on to your home movie collection. You can also send to the Internet or send to iPhone and iPad. Perfectly compatible with macOS 10.14 Mojave, 10.13 High Sierra, 10.12 Sierra, 10.11 El Capitan, 10.10 Yosemite, 10.9 Mavericks or earlier, and Windows 10/8/7/XP/Vista. Launch the Mac app, drag & drop your source OGG files directly to the Converter. Just as what has mentioned above, you can convert several files at a time, no limitation in the file format, i.e, you can add both video and audio files to convert and set different output formats for each. At the program bottom, you will see a row of output formats and under the audio icon, you can select "MP3" as the output format. If you want to reduce the file size to save your space, you can customize the bit rate or other audio settings to smaller the file size. You can adjust the format parameters and save it as a custom profile for other conversions. At the bottom of the Converter, click "Convert", then the Mac Video Converter will finish the rest automatically. Free Studio is really a gathering of a few projects. Simply click Convert from the principle menu, and afterward pick the Free Audio Converter choice to open the audio converter instrument. It is anything but difficult to utilize and gives you a chance to pick a yield quality, round out audio labels, naturally shutdown the PC subsequent to changing over files, and import files from the Windows right-click setting menu. It supports single and batch audio conversion. Switch Audio File Converter bolsters cluster conversions and entire organizer imports, and also simplified and heaps of cutting edge settings. You can likewise utilize Switch Sound File Converter to concentrate audio from your video files and CDs/DVDs, and also catch audio from a live audio stream from the Internet. 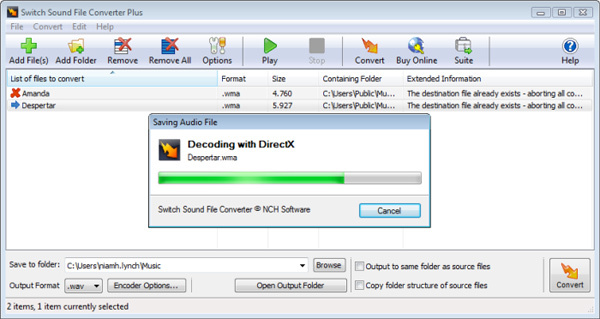 A portion of the propelled settings in Switch Sound File Converter incorporate erasing the source audio file after a conversion, consequently normalizing audio, altering labels, and downloading CD collection subtle elements from the Internet. Another choice important is one that gives you a chance to set up to three preset conversion organizes with the goal that you can right-tap on an audio file and pick one of those organizations for a speedy conversion. It's a gigantic help. Allows you to record audio streams off the internet. You have to pay for phone support. Media.iO implies in spite of the fact that you don't need to download any product to utilize it, you do need to transfer and download your files to make it work. In the wake of stacking at least one audio files to Media.iO, you simply need to pick a yield quality and one of the yield groups from underneath. Once the files have been converted, you can download them independently or together in a ZIP file. 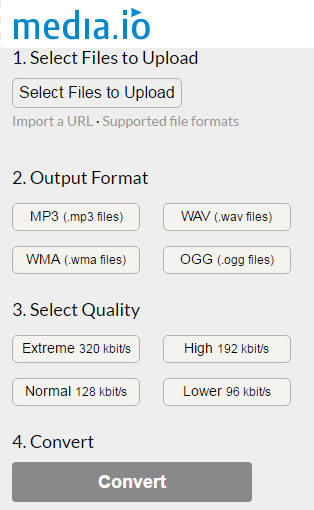 Supports MP3, WAV, WMA and OGG output formats. Option to Manage Audio Quality such as Extreme, High, Normal or Lower Audio Quality. Supports Multiple AAC File conversions. Time Consuming for Conversion of Bulk Audio Files. 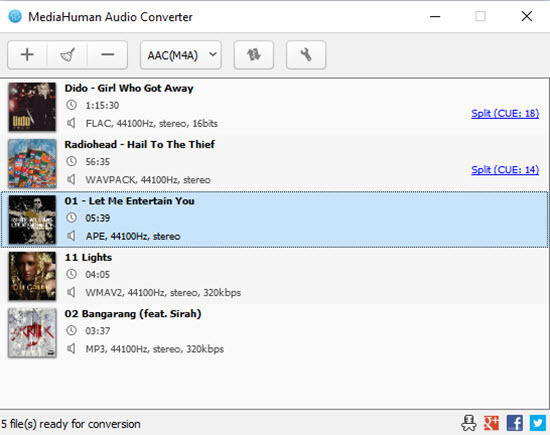 In case you're searching for a straightforward program that works without the propelled choices and befuddling interfaces that some of these audio converter apparatuses have, you'll certainly like MediaHuman Audio Converter. Simply simplified the audio files you require converted straightforwardly into the program, pick a yield organization, and after that begin the conversion. On the off chance that you do need more propelled choices, MediaHuman Audio Converter lets you modify things like the default yield organizer, regardless of whether you need to consequently add the converted melodies to iTunes, and in the event that you need to look for secretive workmanship from online, among different alternatives. Compitable for nearly all Windows and Mac Versions. Doesn't say what level flac it splits to. 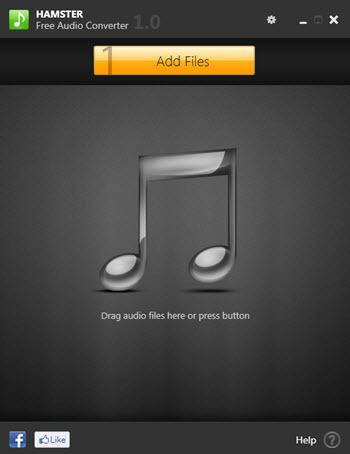 Hamster is a free audio converter that introduces rapidly, has a negligible interface, and isn't difficult to utilize. Not exclusively can Hamster change over numerous audio files in mass, however it can blend the files into one, much like Freemake Audio Converter. Subsequent to bringing in files to change over, Hamster gives you a chance to pick any of the yield designs from above or pick from a gadget in case you don't know what arrange the file should be in, as Sony, Apple, Nokia, Philips, Microsoft, BlackBerry, HTC, and others. 100% Free and simple interface. Support for almost every video type that exists. Hardly crashes and conversion speed is fast. 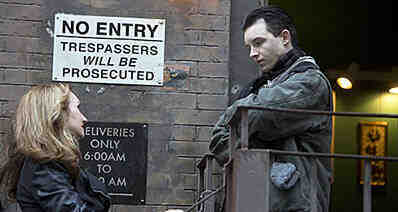 Failure to detect details of some video files. Lack of details for device conversions. Lack of Widescreen support for Xbox. 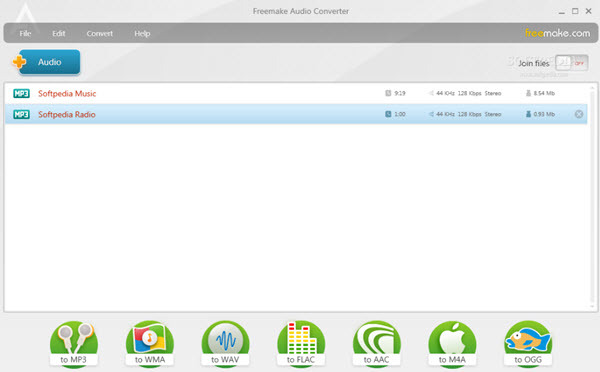 Freemake Audio Converter bolsters a few normal audio arranges and is amazingly simple to utilize. Notwithstanding changing over single audio files into different organizations in mass, you can join various files into one bigger audio files with Freemake Audio Converter. The installer for Freemake Audio Converter will endeavor to introduce different projects that are disconnected to the converter, so make certain to uncheck those alternatives before completing setup on the off chance that you don't need them added to your PC. You may likewise need to look at Freemake Video Converter, another program from an indistinguishable designers from Freemake Audio Converter that backings more audio information positions than this converter (however less audio yield arrangements), and more elements like changing over neighborhood and online recordings into MP3. Merge video files and support subtitles. Editing imported subtitles requires a purchase of a Subtitles Pack. May try to install unrelated software during setup. VSDC Free Audio Converter has a selected interface that is uncomplicated to comprehend and isn't jumbled with pointless catches. Simply stack up the audio files you need to change over, or enter the URL for an online file, pick the Formats tab to choose a yield organization, and snap Start conversion to change over the files. There's additionally a label proofreader for altering a track's title, writer, collection, classification, and so forth, and also an implicit player for tuning in to melodies before you change over them. The installer will attempt to add pointless projects and devices to your PC in the event that you let it. 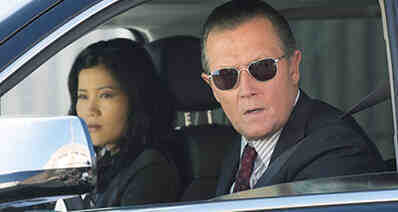 Make sure to look for these and cripple them on the off chance that you wish. It provides different output options and several useful filters. It requires computer resources at a high level(RAM and CPU). FileZigZag is an online audio converter benefit that will change over most basic audio groups. Everything you do is transfer the first audio file, pick the coveted yield arrangement, and afterward sit tight for an email with a connection to the converted file. The most noticeably bad thing about FileZigZag is the time it takes to transfer the audio file and get the connection in your email. In any case, most audio files, even long music tracks, arrive in a quite little size so it's not more often than not an issue. FileZigZag ought to work with every single working framework that bolster a web program, similar to macOS, Windows, and Linux. Free and no programs to install - service is 100% web based. Converts a variety of files from one format to another. Conversion time is slow but faster than some other online file converters. 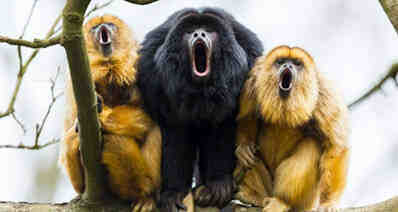 Zamzar is another online audio converter benefit that backings most normal music and audio positions. The greatest burden with Zamzar is their 50 MB confine for source files. While numerous audio files are littler than this, some low pressure arrangements can surpass this little cutoff. Zamzar can be utilized with essentially any cutting edge web program on any OS, for example, Windows, Mac, and Linux. Free file conversions (up to 50 MB). Converts a large variety of files from one format to another. 50 MB file size limit makes it very difficult to use for video and audio conversions. Conversion time is very slow. SUPER is particularly a prevalent free audio converter. The best thing about SUPER is the not insignificant rundown of audio organizations it underpins. In the event that you have an uncommon audio file you need to change over to something more typical (or the other way around), you ought to attempt the SUPER audio converter.